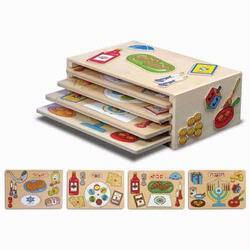 Set of 4 holiday puzzles provides great value, while celebrating positive play-habits. Children love to play with peg puzzles, and KidKraft’s Holiday Puzzle set has diverse shapes and themes, ensuring that they never tire of the same puzzle challenge. The set comes in a colorful wooden puzzle rack to make storage simple.